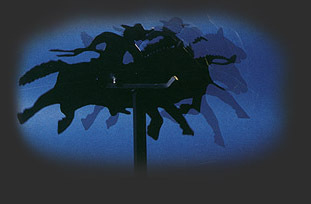 "My kinetic animated silhouettes are hand cut from 1/4 inch steel plate. I construct them individually which gives a uniqueness to each work. These pieces depict various animal shapes, animal - people relationships and social stereotypes. The movement brings the work to life, captivates the onlookers' imagination and transports them into the fantasy portrayed by the sculpture"